Today the PBG attempts to assist with finding some instructions, the correct frost depth, and nailing schedule for OSB. 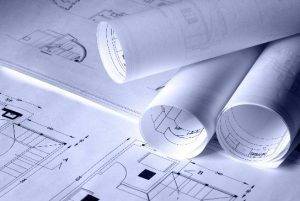 DEAR ROBERT: The column depths will be specified on the sealed plans produced by your RDP (Registered Design Professional – architect or engineer). If they are missing you should contact the RDP directly to receive clarification. In no instance should the bottom of the column holes be above the maximum frost depth, which in your case would mean 54 inch deep holes. When it comes to post frame buildings – the last place to scrimp on or cheap out is the foundation. With the correct diameter concrete footings, proper depth and provision for uplift resistance (all of which your RDP should have addressed) you should be off to a terrific start. 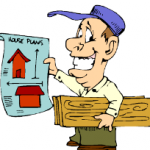 DEAR JIM: The nailing schedules for sheet sidings and sheathing is always found on the “A” pages of the engineered plans provided with your building. Usually they are in a tabular box. 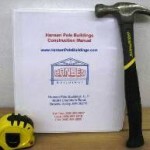 For those who are reading and somehow did not invest in a Hansen Pole Building kit package – if the nailing is not found on your plans, do not guess or take a chance – contact your RDP (Registered Design Professional – architect or engineer) and have them provide a nailing schedule sealed by them. This entry was posted in Roofing Materials, Pole Barn Planning, Footings, Professional Engineer and tagged frost depth, sliding door, post holes, Nailing pattern on June 18, 2018 by admin. Yeah, right….and what did this tell you? Frost heave can do nasty things to pole buildings with improper or inadequate footing designs. When pressure preservative treated columns are embedded to an inadequate depth, or are encased in concrete where the holes are conical (wider at the top than at the bottom), they can be prone to heave. 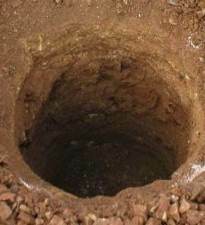 In winter, ground freezes from the top of the soil downward. The depth of frost penetration depends on soil type, the severity of the winter, the amount of water in the soil and depth of an insulating blanket of snow. The frost depth varies by region. In frigid northern climates, the frost depth can be 60 inches or more, whereas a warmer southern state frost may not even be an issue. Your local building department can be called and asked what the frost depth requirement is. Then dig the footing holes so that the bottoms of the pole building footings are at or below the frost depth. When water freezes, it expands (think of how ice cubes have a dome shape above the original water level in the ice cube tray). Ice exerts a pressure of about 50,000 lbs. per square inch—enough force to lift even a large building. A pole barn on inadequate footings doesn’t stand a chance. The reason buildings don’t always return to their original height is that surrounding dirt sometimes fills in under the footing while it’s lifted. Heavy clay soils don’t drain well, so they tend to have more frost heave problems than sandy, well-drained ones. But even if pole building footings are deep enough, ice lenses can latch onto the rough surfaces of wood and concrete and lift footings and posts from the side. This potential problem can be alleviated by increasing the diameter at the bottom of the holes. Bottom line: make sure your pole building footing design extends below the frost line. Frost acts randomly, so unless you are planning on selling tickets to “pole building at a slant”, make sure your building stays…exactly where you put it. This entry was posted in Building Styles and Designs, Building Department, Pole Barn Planning, Pole Barn Structure and tagged footing design, foundation walls, frost depth, frost heave on February 17, 2012 by admin.